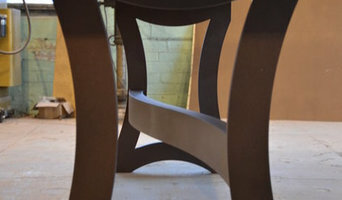 We are a custom metal and wood design and fabrication studio. We currently occupy 6500 SqFt in Cincinnati's west end. As a result of the background of our team and the investments we have made into tooling and machining, we can handle projects of any scale or complexity. We love truly custom work and enjoy watching our clients dreams become a reality. We ship regularly to the east and west coast of the continental US as well as we have shipped internationally, as far as Singapore. 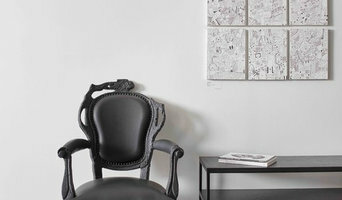 The studio provides fine art and special finishes on accessories and furniture for professional designers and clients.Mural and ceiling paintings,restoration and custom design are available.The studio brings artistic techniques and styling from the past to enhance private and public interiors. Design Lab is a purveyor of beautifully designed and thoughtfully curated modern furniture, lighting and objects. We represent designers and artists whom we believe to have an independent, authentic and thoughtful sense of design. We believe the furniture, lighting and objects a person chooses for their life are a reflection of their values and perspective. We hope to provide a unique point of view that inspires a deeper appreciation in our lifestyles. Design Lab is more than a furniture showroom; Design Lab celebrates modern living at its best, tailoring products and projects to truly enhance clients' experience. The leading retailer of luxury home products with unsurpassed quality and long-term value that consistently exceeds our customer’s expectations. Our Pledge: To offer extraordinary products that outperform and outlast the ordinary. Outfitting America's Finest Homes Since 1991. Our products are designed to instill life into extraordinary spaces, whatever their size. They’re created for welcoming, hosting, entertaining. They’re products of presence, made to be lived in and to endure the test of time. And we believe in the extraordinary value of quality, service and a long-term commitment to both our customers and our products. We proudly support every product we sell with world-class customer care and an industry-best satisfaction guarantee. Our promise is to meet, and exceed, our customer’s highest expectations. You know the jingle, but do you know what it means? Hint, a local family business offering better quality furniture, personal family-like service, and leaving you with the satisfaction of knowing you made the best choice for your family & your home. Our customers appreciate our approach to furniture and mattresses and leave our stores humming the words... "at Cedar Hill Furniture, you're gonna love the change." And that brings a smile to our faces. For over 40 years and with the specific purpose of offering quality American-made furniture for less, Cedar Hill Furniture has developed, nurtured, and maintained personal long term relationships with the very best American furniture companies in the industry. Sofas upholstered in North Carolina are common. Bedrooms built in Virginia are affordable. La-Z-Boy recliners manufactured at the Tennessee recliner plant are always on SALE. Did you know that Cedar Hill Furniture has one of the largest selections of hand-crafted Ohio Amish bedrooms, dining, and end tables in the Miami Valley? SLIM IS A PORTABLE, HIGH QUALITY, MODULAR FURNITURE SYSTEM THAT IS CONSTRUCTED AND DECONSTRUCTED EASILY WITHOUT THE USE OF TOOLS! Set-it-up, knock-it-down, and throw it in the back seat of a Kia. Slim always fits in an elevator, but taking the stairs is an option. No time, No tools, No hassle! Your bulky move is now simplified. Slim is durable, high-quality modular furniture designed for any setting which you customize to fit your personality, living space, and ambitious lifestyle. 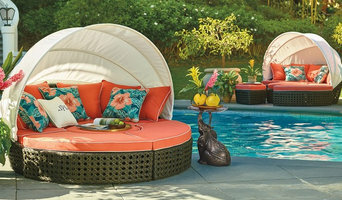 Slim’s modular build and patented ratchet assembly allows you to connect and interchange basic building blocks to create an infinite variation of ottomans, chairs, love seats, couches, and anything else you can imagine…all in five minutes. Better yet, Slim won’t burn a hole in your pocket but it looks like it did. Priced lower than other modular competitors and built better than anything from Europe that you can’t pronounce, Slim Furniture doesn’t just look classy, it’s built for portability. Deconstruct it, reconstruct it, and reuse it – without nails, screws, or that cheap “one-and-done” wood. Slim is solid. When it’s time to move on and you’re ready for a change of scenery Slim is there so you can pack-it-up, get out-the-door, and get on to life’s next adventure. You were born to live a life beyond walls. The freedom to move is a part of your nature. Bottom-line, you or your child’s ever-changing lifestyle needs an adaptable companion to keep on keeping on. Slim Furniture – Simple, classy, and in it for the long haul. Doug Frates Glass was founded in 2005 and has quickly become one of the world’s most recognized art glass producers. The company is owned and operated by Doug Frates, who is involved with each piece the company creates. With inspiration drawn from nature and everyday life, the pieces created at Doug Frates Glass are modern with a nod to the classic styles and techniques Doug learned during his time in Tucson, AZ spent studying with art glass greats Fritz Dreisbach and Tom Philabaum. Our company is product-line oriented, providing a diversified selection that remains customizable to fit your specific project needs. Each work of art is American-made art glass hand crafted from the highest-quality materials to ensure true, vibrant colors. We offer hundreds of color options, from fiery to tranquil, to complement any decor. Custom works from Doug Frates Glass, often created at the request of designers and hospitality industry representatives, can be the perfect fit for any project. Colors, sizes, shapes and other details can be incorporated into one piece or dozens, depending on your needs. We encourage submissions of design boards, photos, drawings, color palettes, fabric swatches, paint samples or any other information that will help us understand your vision for custom-designed glass artworks. We promise to walk through the ordering process with you to ensure your satisfaction. At Doug Frates Glass, we are committed to creating singularly beautiful, arrestingly modern, elegant art glass pieces. Our art has the potential to transform your space, helping you express your creativity and style. Harold Verbarg started in the furniture business at the age of 15 when he made furniture by hand. This "made-by- hand" attitude -- looking at furniture building as a form of art -- means that only the highest quality merchandise is permitted within Verbarg's showrooms. In showrooms that make you feel right at home, Verbarg's carries furniture to fit any lifestyle. Verbarg's only offers the finest crafted furniture, so you know you are getting the finest when you shop at Verbarg's. And you never have to worry about how you'll get your new purchases home. Verbarg's offers delivery in company- owned trucks by company employees, so you can rest assured that your new purchase will be delivered to your home safely. Harold and Shirley Verbarg and all of their family invite you to come in and see why Verbarg's furniture is the right place to find all of your home furnishing needs! Our furniture store specializes in high quality handmade Amish furniture. The collection of solid wood furniture, fine upholstered sofas and chairs, and home furnishings are all hand crafted in Amish wood shops. The possibilities are endless with our custom furniture in your choice of styles, wood finish and fabrics. You'll find quality furniture made from domestic hardwoods for the entire home. We offer bedroom furniture and mattresses, dining rooms, living rooms, office furniture, children's furniture, outdoor patio furniture and more. Our customers visit our large showroom from all over Ohio. Visit us online or come to our showroom. Restored Treasures has an array of services to make your furnishings new again. Located in historic Glendale, Restored Treasures offers furniture repurposing, furniture refinishing, decorative painting and furniture resale. Whether it is a family heirloom or a newer piece of furniture, we can bring new life and a new look to your favorite home décor. Buy It Today, Have it Today! With over 120,000 square feet of quality furniture, we have thousands of items in stock now. Buy your furniture today and pick it up today or have it delivered. Take a stroll down memory lane in our new, totally remodeled 1890’s store in HISTORIC RICHMOND. 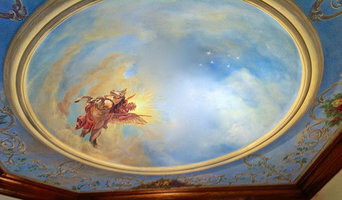 Acclaimed artists have created a unique environment with colorful murals and brought this building back to its original old-time splendor and charm. See what’s happening in the Historic Richmond Depot District. Step back in time for old-fashioned service and old time prices. 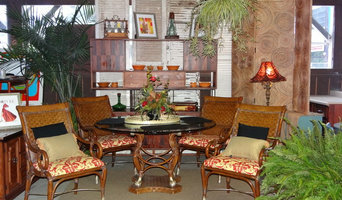 Feel the charm and nostalgia of yesteryear when you visit the Historic Richmond Furniture Gallery – I’LL Save You Money! We are thrilled to be celebrating 61 Years in Business in 2015! In 1954 Paul and Katherine Richert started Richmond Auction and Furniture in Richmond, Indiana. In 1982 their son, auctioneer Roger Richert, took over the reins of the family business. Roger expanded the business, opening Furniture Outlets in Richmond, Muncie, Daleville and New Castle, and in 2004 renovated and restored their flagship store, Richmond Furniture Gallery in Historic Richmond. At 92 years young, Paul still comes to work every day! Roger, along with his wife Theresa and daughter Natalie continue the family tradition of friendly customer service and living up to their motto, “I’LL SAVE YOU MONEY!” When you walk into the Richmond Furniture Gallery for the first time you may feel as if you are walking back in time. After you enter under an artist’s recreation of a 40-foot chair, you are greeted with original antique punched tin ceilings and ornate oak woodwork that adorn the office area plus, the World’s Largest Dining Room Chair and An Amazing Handmade Penny Castle. Historic Postcards, blown up to the size of billboards, are displayed throughout the store. Want something truly unique - setting your interior apart? Tired of ordinary lighting? Searching for that special ultra-modern focal point? Maybe a stunning Cascading Murano Italian Glass Mirrored Neon Chandelier, neon artwork, sculpture, tabletop centerpiece, or your name in deluxe neon script? John C. Barton – International Neon Glass Artist, Middletown, Ohio, USA – renowned for dazzling ‘Normā Over Paris’® trademarked, signed designer originals, found nowhere else. Luscious neon artworks, chandeliers, and sculptures designed, hand-blown, and made in state-of-the-art neon studios of Barton Neon Magic – including custom work made to order. With an Arts/Professional degree, and many years of experience in personally designing and making exquisite luminous neon showpieces, I enjoy ‘pushing the envelope’ of neon as the ULTIMATE art form - brilliant fluid colors of light cascading through space. Custom neon spectaculars in shades of white, pastels, and deep colors of Murano Italian glass, colored even when ‘off’, similar to stained glass. Absolute finest quality throughout, energy efficient, self-contained and ready to hang – or tabletop. Also specializing in dazzling original script Packard, Studebaker, and Avanti custom neon signs - by John C. Barton - Barton Sales & Service – former new car dealers for Packard, Studebaker, Fiat, Triumph, BMW, NSU, and Citroen. Only former new Studebaker Packard Dealer in the world personally hand-blowing and signing exquisite neon tributes to these finest of luxury cars. Commercial, restaurant, retail, and corporate neon lighting décor and signs - also a specialty. Speaking directly with the International Neon Glass Artist, nothing is lost in the translation – personal service – resulting in BREATHTAKING interior luminous neon decor for home, loft, condo, or business. Shipping to any location. Website: www.BartonNeonMagic.com . Telephone: 513-423-2618. Email: info@BartonNeonMagic.com . THE ULTIMATE – call today and transform YOUR interior into SPECTACULAR! Start your research right here on Houzz. Read through professionals’ profile pages to find out important details, like how long a manufacturer has been in business. Look at reviews by design professionals and find out which furniture makers offer the best customer service. Are you looking for condo-size furnishings or working with an oddly shaped room? Necessity is the mother of invention, so opt for a custom piece made by an experienced Ohio furniture maker. Here are some related professionals and vendors to complement the work of furniture & accessories: Interior Designers & Decorators, Artists & Artisans, Kids & Nursery, Closet Designers and Professional Organizers, Bedding & Bath. Take your time on any buying decisions. If contemporary is your style, don’t buy something traditional because it’s on sale. Many Ohio home furnishers offer interior design consultations or room planning guides to get you started. Whether you decide to work with a home decor specialist or to become your own expert, it’s important not to rush the furniture-buying process. Visit plenty of Dayton, OH showrooms and stores so you can feel comfortable with your purchase. Find furniture and accessories manufacturers, showrooms and retailers on Houzz. Narrow your search in the Professionals section of the website to Dayton, OH furniture and accessories, then choose the nearest metro area for showrooms and retailers. Or you may want to look through Ohio photos to find designs you like and contact the furniture manufacturers and showroom galleries directly.